Dominick Grace and Eric Hoffman, eds., The Canadian Alternative: Cartoonists, Comics, and Graphic Novels (University Press of Mississippi, 2018). 304 pp, $65. While published by an American publisher, this book is quite Canadian in character, not making grand claims, but instead going with the diplomatic, “kinder, gentler” image of the Canadian alternative in comics. The Canadian Alternative offers useful historical overviews and interesting readings, and avoids getting into hot water with the larger, stronger neighbor, the US and its mainstream comics, in part by avoiding mention of the work of Canadians in that realm. The collection includes chapters on Ray Fawkes and Jeff Lemire, both of whom work in mainstream US comics, but the chapters dedicated to them only look at their alternative comics work. 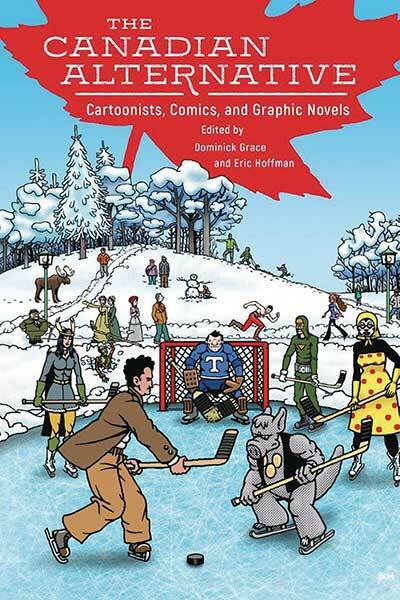 The full subtitle of the book, given on the interior title page though not on the cover or spine, is Cartoonists, Comics, and Graphic Novels from the North, which implies an orientation or point of view of the book not from within Canada itself, but rather from the US, to which Canada is geographically North. The implication is that the readership is from outside Canada, and chapters vary the degree to which they offer context for non-Canadians, sometimes giving copious background information—as in Ian Brody’s discussion of Cape Breton’s own “Moose” MacKinnon and Paddy Johnston’s chapter “Michel Gets a Comics Job”—while at other times barely providing any at all—such as Mark J. McLaughlin’s chapter on Canadian government comics, which is very insightful in its detailed discussion of the sample Our Forest Lands and the interests being served by this comic, but is rather light on concrete information about government comics in general. The introduction by Dominick Grace and Eric Hoffman serves well, laying out why the idea of being alternative works as a means to tie the outputs of so many Canadian artists together within this collection, offering a quick and useful historical overview, and clearly breaking down the structure of the book in its four sections—Alternative History, Alternative Worlds, Alternative Comics, and Alternative Perspectives. It also shows that the editors have probably chosen for breadth rather than depth in its scope, with seventeen short-ish chapters, almost invariably each on a different cartoonist (or several), with the exception of the last section where we get two chapters each on Nina Bunjevac and Jeff Lemire. While offering necessary history, the first section is probably the weakest, with chapters that rely mainly on historical summary, the discussion of an entire genre based on very little data, and on personal anecdote. I will show my own ignorance here and admit that I had not heard of Gene Day before, but the chapter about him failed to convince me that he deserved to have an entire chapter dedicated to his career, despite the fact of his unfortunate premature death. These first chapters may in part have suffered from my own bias of expecting a certain kind of academic discourse, and the alternative types of scholarship offered by several of the authors in this section felt jarring to me. Throughout the collection, I felt that some chapters could use more contextual commentary. Perhaps section introductions would have helped to justify the inclusion of certain chapters, or might have explained some of the quirks of the less academic writing. Many chapters take the time to demonstrate how Canadianness or alternativeness works in relation to their chosen topic, but this is not always the case, which is again something that might have been mitigated by section introductions. The best chapters really get at something related to both the keywords of the title, the Canadianness of their chosen subject and how it functions as alternative. This works particularly well in Johnston’s chapter on Michel Rabagliati and in Annick Pellegrin’s chapter on Les Nombrils, and generally in the chapters included in their section, Alternative Worlds: they touch on qualities in these works that relate to their Canadian origins, and also elucidate how these creations are alternative, alternative to the usual Spiroufare, in Pellegrin’s case, or an alternative career path, as Rabagliati exemplifies. Part III includes chapters on some of the superstars of the titular alternative comics: Chester Brown, Seth, and Dave Sim are all covered, but these chapters don’t really shed any light on what makes these works alternative. Daniel Marrone’s chapter on Hark! A Vagrantis more successful in this regard, getting at Beaton’s distinctly Canadian use of humor in her webcomic, while also hinting at the alternative path of her break into comics. In Joan Ormrod’s chapter “The Postcolonial Enterprise of Trillium,” her inclusion of sketched “mappings” of several pages at the end of the work, schematically indicating the layouts and panels of these pages, is an elegant solution I had not seen before for visually indicating the progression of a significant sequence, without having to reproduce the full sequence from the comic as figures, with the concomitant copyright headaches. Ormrod’s chapter is one of two dealing with Lemire’s work, the other, by Jocelyn Sakal Froese, focused on Essex County. The other cartoonist discussed in this final section is Serbian-Canadian Nina Bunjevac, with chapters on her books Fatherlandand Heartlessby Mihaela Precup and Laura A. Pearson respectively. The more in-depth engagement with these two creators through the multiple chapters is appreciated by this point in the collection, as different perspectives and approaches to the works can be explored, and the chapters together offer a deeper level of insight into these creators’ works. However, in the collection as a whole, the diversity in the chapter topics does allow a great range of Canadian cartooning to come under scrutiny, giving an impression of the expansive diversity of comics work being done in Canada, now and in the past.